Nageena Khan, founder of Get2Gether (Mil Jul) talks to us about bringing her community together with a Lunar Lunch. I have been hosting a Big Lunch in my local community of Bradford Moor since 2012. 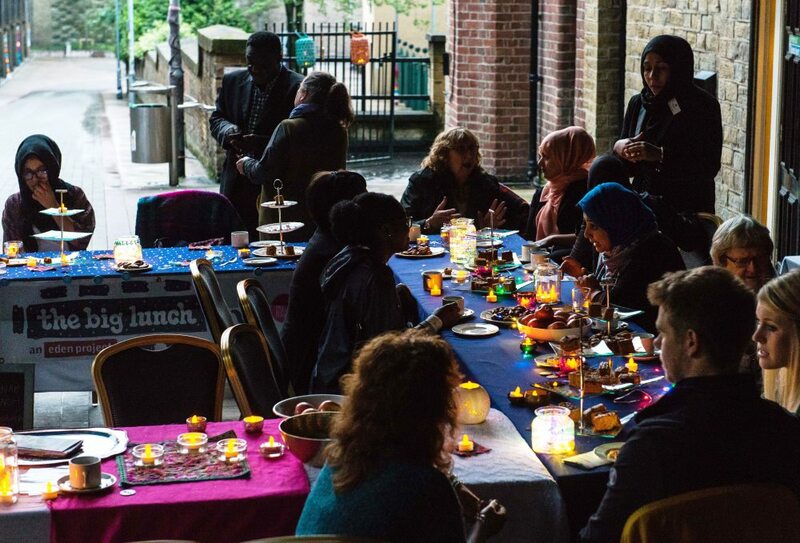 The events are rewarding because they are attended by people of all ages and cultures and have a very relaxing, friendly atmosphere, allowing the community to share a universal love of food whilst talking about issues that affect them. These events are crucial because they help to address the issues around loneliness within Bradford Moor identified by the local community following our involvement in the Neighbourhood approaches to loneliness programme, funded by Joseph Rowntree Foundation. These two initiatives were the catalysts that helped me understand the underlying challenges facing our community and they offer possible solutions. They inspired and supported me to set up a confidence building group to empower local people to make positive changes in their community, with a clear focus on reducing loneliness. Since then we have set up a charity organisation called Get2Gether (Mil Jul). We look at ways to allow the community to meet in safe spaces, to share culture and skills, break down social barriers and help people connect. Get2Gether is a group of local women who all want to improve their community and make it a happier place to live. People want to make things better, but they lack confidence. Initially, a lot of my work focused on tackling these hurdles and building relationships within the community in order to bring about positive change. The members of Get2Gether are now empowered ambassadors who are able to speak to members of the community about issues and implement ways to improve them. Get2Gether holds many events, as well as The Big Lunch we also organise Cultural Community Markets. These events have grown and now over 800 people attend. The markets are safe spaces to share culture and skills and find out what is available in the community and to find out who their neighbours are — they benefit residents of all ages. What I love about The Big Lunch is the simplicity — it’s about getting together with your community to mix with different generations and cultures to have meaningful conversations with others. We share our stories, our love of food and our community. It’s a really positive event that brings people together, friendships grow, new ideas from and blossom. The Lunar Lunch offers an alternative to the traditional lunch, which is great because some people find daytime events difficult because of working patterns, religious beliefs and difficulties in making ends meet. With a Big Lunar Lunch, everyone can come to the table! I have always received such positive feedback about the events we hold and people request they take place much more frequently. The Big Lunch is happening during the month of Ramadan, where the traditional lunch hour will be missed during this blessed time. So this year I will be hosting a Big Lunar Lunch at iftari time (sunset), for those in my community who will be observing the blessed month of Ramadan. As a Muslim, I believe that before asking God for the welfare of one’s own household, we should ask for the same blessings for our neighbours. Ramadan is a time of spiritual renewal, doing good for others, prayer, and re-commitment to bettering oneself. We enjoy the increased opportunities to spend time and strengthen bonds with our families, friends and the community. Following the precedents set by the Prophet Muhammed (peace and blessings be upon him) many people in my community deliver iftar platters to the neighbours as a way of spreading the Ramadan cheer and spirit. This opens up lines of communication, appreciation, and understanding between people. This is indeed a good tradition and I want to take this one step further by hosting a Big Lunar Lunch at iftari time. So join me — get together with your community to have a Big Lunar Lunch! If we all embrace the opportunity to throw Lunar Lunch, we can make this a really positive time for everyone that will inspire others even beyond Ramadan. Find out more about the Lunar Lunch here. What I love about The Big Lunch is the simplicity — it’s about getting together with your community to mix with different generations and cultures to have meaningful conversations with others.